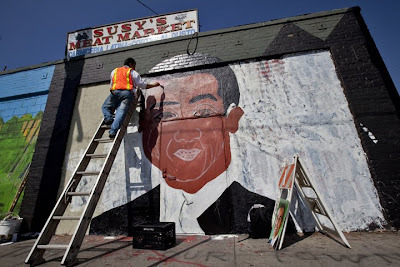 The mural saga at Susy's Market in East Hollywood continues. 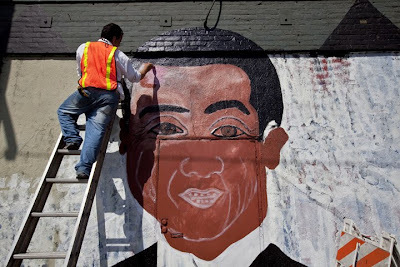 A new mural of L.A. Mayor Antonio Villaraigosa is getting repainted by Jorge Lopez, also known as Marciano, to replace the vandal laden one painted by mural artist Rabi. Lopez has painted all of the previous murals at Susy's Market except for the last one who was painted by the talented Rabi. Lopez, who was commissioned by Susy's Market, vows to keep up the mural from vandals.